This type of modulation Is the most flexible in that the loading adjustment can be made In a short period of time and without elaborate test equipment after o change In operating frequency of the Class C amplifier has been made. power output capability of one-half the input to the Class C stage. If the modulator is a Class B audio amplifier, the average power required of it may vary from one-quarter to more than one-half the Class C input depending upon the waveform. However, the peak power output of any modulator must be equal to the Class C input to be modulated. Modulation system of plate modulation, and usually consists of a Class A audio amplifier coupled to the r-f amplifier by means of a modulation choke coil, as shown in figure 7. The d.c. plate voltage and plate current in the r-f amplifier must be adjusted to a value which will cause the plate impedance to match the output of the modulator, since the modulation choke gives a 1-to-l coupling ratio. A series resistor, by-passed for audio frequencies by means of a capacitor, must be connected in series with the plate of the r-f amplifier to obtain modulation up to 100 per cent. The peak output voltage of a Class A amplifier does not reach a value equal to the d-c voltage applied to the amplifier and, consequently, the d-c plate voltage impressed across the r-f tube must be reduced to a value equal to the maximum available a-c peak voltage if 100% modulation is to be obtained. A higher degree of distortion can be tolerated in low-power emergency phone transmitters which use a pentode modulator tube, and the series resistor and by-pass capacitor are usually omitted in such transmitters. Plate Modulation modulation is the least expensive method of plate modulation. 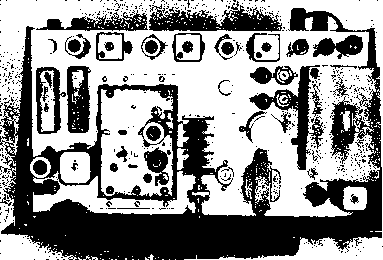 Figure 8 shows a conventional Class B plate-modulated Class C amplifier. The statement that the modulator output power must be one-half the Class C input for 100 per cent modulation is correct only if the waveform of the modulating power is a sine wave. Where the modulator waveform is undipped speech, the average modulator power for 100 per cent modulation is considerably less than one-half the Class C input. Power Relations in It has been determined ex-Speech Waveforms perimentally that the ratio of peak to average power in a speech waveform is approximately 4 to 1 as contrasted to a ratio of 2 to 1 in a sine wave. This is due to the high harmonic content of such a waveform, and to the fact that this high harmonic content manifests itself by making the wave unsymmetrical and causing sharp peaks or "fingers" of high energy content to appear. Thus for undipped speech, the average modulator plate current, plate dissipation, and power output are approximately one-half the sine wave values for a given peak output power. Both peak power and average power are necessarily associated with waveform. Peak power is just what the name implies; the power at the peak of a wave. Peak power, although of the utmost importance in modulation, is of no great significance in a-c power work, except insofar as the average power may be determined from the peak value of a known wave form. There is no time element implied in the definition of peak power; peak power may be instantaneous—and for this reason average power, which is definitely associated with time, is the important factor in plate dissipation. It is possible that the peak power of a given waveform be several times the average value; for a sine wave, the peak power is twice the average value, and for undipped speech the peak power is approximately four times the average value. For 100 per cent modulation, the peak (instantaneous) audio power must equal the Class C input, although the average power for this value of peak varies widely depending upon the modulator waveform, being greater than 50 per cent for speech that has been clipped and filtered, 50 per cent for a sine wave, and about 25 per cent for typical undipped speech tones. Modulation The modulation transformer is Transformer a device for matching the load Calculations impedance of the Class C amplifier to the recommended load impedance of the Class B modulator tubes. Modulation transformers intended for communications work are usually designed to carry the Class C plate current through their secondary windings, as shown in figure 8. The manufacturer's ratings should be consulted to insure that the d-c plate current passed through the secondary winding does not exceed the maximum rating. A detailed discussion of the method of making modulation transformer calculations has been given in Chapter Six. However, to emphasize the method of making the calculation, an additional example will be given. Suppose we take the case of a Class C amplifier operating at a plate voltage of 2000 with 225 ma. of plate current. 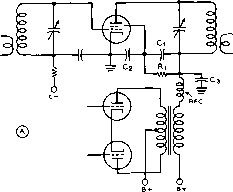 This amplifier would present a load resistance of 2000 divided by 0.225 amperes or 8888 ohms. The plate power input would be 2000 times 0.225 or 450 watts. By reference to Chapter Six we see that a pair of 811 tubes operating at 1500 plate volts will deliver 225 watts of audio output. The plate-to-plate load resistance for these tubes under the specified operating conditions is 18,000 ohms. Hence our problem is to match the Class C amplifier load resistance of 8888 ohms to the 18,000-ohm load resistance required by the modulator tubes. The transformer must have a turns ratio of approximately l-to-0.7 step down, total primary to total secondary. The greater number of turns always goes with the higher impedance, and vice versa. The screen r-f by-pass capacitor C2 t should not have a greater value than 0.005 pid., preferably not larger than 0.001 /zfd. It should be large enough to bypass effectively all r-f voltage without short-circuiting high-frequency audio voltages. The plate by-pass capacitor can be of any value from 0. 002 ¡ifd. to 0. 005 fjd. The screen-dropping resistor, Rj should reduce the applied high voltage to the value specified for operating the particular tube in the circuit. Capacitor Q is seldom required yet some tubes may require this capacitor in order to keep C2 from attenuating the high frequencies. Different values between .0002 and .002 /ifd. should be tried for best results. PLATE MODULATION OF A BEAM TETRODE OR SCREEN-GRID TUBE These alternative arrangements for plate modulation of tetrodes or pentodes are discussed In detail in the text. The arrangements shown at (B) or (D) are recommended for most applications. a low-voltage power supply. The ratio of turns between the two output windings depends upon the type of screen-grid tube which is being modulated. Normally it will be such that the screen voltage is being modulated 60 per cent when the plate voltage is receiving 100 per cent modulation. If the screen voltage is derived from a dropping resistor (not a divider) that is bypassed for r.f. but not a.f., it is possible to secure quite good modulation by applying modulation only to the plate. Under these conditions, the screen tends to modulate itself, the screen voltage varying over the audio cycle as a result of the screen impedance increasing with plate voltage, and decreasing with a decrease in plate voltage. 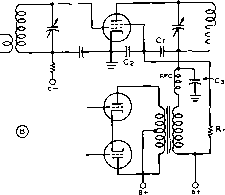 This circuit arrangement is illustrated in figure 9B. A similar application of this principle is shown in figure 9D. In this case the screen voltage is fed directly from a low-voltage supply of the proper potential through a choke L. A conventional filter choke having an inductance from 10 to 20 henries will be satisfactory for L.
To afford protection of the tube when plate voltage is not applied but screen voltage is supplied from the exciter power supply, when using the arrangement of figure 9D, a resistor of 3000 to 10, 000 ohms can be connected in series with the chokeL.In this case the screen supply voltage should be at least 1% times as much as is required tor actual screen voltage, and the value of resistor is chosen such that with normal screen current the drop through the resistor and choke will be such that normal screen voltage will be applied to the tube. When the plate voltage is removed the screen current will increase greatly and the drop through resistor R will increase to such a value that the screen voltage will be lowered to the point where the screen dissipation on the tube will not be exceeded. However, the supply voltage and value of resistor R must be chosen carefully so that the maximum rated screen dissipation cannot be exceeded. The maximum possible screen dissipation using this arrangement is equal to: W = EJ/4R where E is the screen supply voltage and R is the combined resistance of the resistor in figure 9D and the d-c resistance of the choke L. It is wise, when using this arrangement to check, using the above formula, to see that the value of W obtained is less than the maximum rated screen dissipation of the tube or tubes used in the modulated stage. This same system can of course also be used in figuring the screen supply circuit of a pentode or tetrode amplifier stage where modulation is not to be applied. The modulation transformer for plate-and-screen-modulation, when utilizing a dropping resistor as shown in figure 9A, is similar to the type of transformer used for any plate modulated phone. The combined screen and plate current is divided into the plate voltage in order to obtain the Class C amplifier load impedance. The peak audio power required to obtain 100 per cent modulation is equal to the d-c power input to the screen, screen resistor, and plate of the modulated r-f stage. Cathode modulation offers a workable compromise between the good plate efficiency but expensive modulator of high-level plate modulation, and the poor plate efficiency but inexpensive modulator of grid modulation. Cathode modulation consists essentially of an admixture of the two. The efficiency of the average well-designed plate-modulated transmitter is in the vicinity of 75 to 80 per cent, with a compromise perhaps at 77.5 per cent. On the other hand, the efficiency of a good grid-modulated transmitter may run from 28 to maybe 40 per cent, with the average falling at about 34 per cent. Now since cathode modulation consists of simultaneous grid and plate modulation, in phase with each other, we can theoretically obtain any efficiency from about 34 to 77.5 per cent from our cathode-modulated stage, depending upon the relative percentages of grid and plate modulation. Since the system is a compromise between the two fundamental modulation arrangements, a value of efficiency approximately half way between the two would seem to be the best compromise. Experience has proved this to be the case. A compromise efficiency of about 56.5 per cent, roughly half way between the two limits, has proved to be optimum. Calculation has shown that this value of efficiency can be obtained from a cathode-modulated amplifier when the audio-frequency modulating power is approximately 20 per cent of the d-c input to the cathode-modulated stage. An Economical Series cathode modulation is Series Cathode ideally suited as an economi-Modulator cal modulating arrangement for a high-power triode c-w transmitter. The modulator can be constructed quite compactly and for a minimum component cost since no power supply is required for it. When it is desired to change over from c-w to 'phone, it is only necessary to cut the series modulator into the cathode return circuit of the c-w amplifier stage. The plate voltage for the modulator tubes and for the speech amplifier is taken from the cathode voltage drop of the modulated stage across the modulator unit. 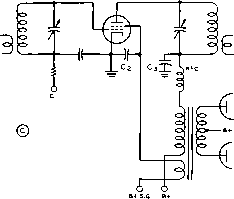 Figure 10 shows the circuit of such a modulator, designed to cathode modulate a Class C amplifier using push-pull 810 tubes, running at a supply voltage of 2500, and with a plate input of 660 watts. The modulated stage runs at about 50% efficiency, giving a power output of nearly 350 watts, fully modulated. The voltage drop across the cathode modulator is 400 volts, allowing a net plate to cathode voltage of 2100 volts on the final amplifier. The plate current of the 810's should be about 330 ma., and the grid current should be approximately 40 ma., making the total cathode current of the modulated stage 370 ma. 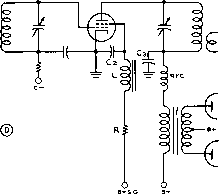 Four parallel 6L6 modulator tubes can pass this amount of plate current without difficulty. It must be remembered that the voltage drop across the cathode modulator is also the cathode bias of the modulated stage. In most cases, no extra grid bias is necessary. If a bias supply is used for c-w operation, it may be removed for cathode modulation, as shown in figure 11. With low-mu triodes, some extra grid bias (over and above that amount supplied by the cathode modulator) may be needed to achieve proper linearity of the modulated stage. In any case, proper operation of a cathode modulated stage should be determined by examining the modulated output waveform of the stage on an oscilloscope. Can you modulate a class a rf amplifier?